If you’ve got grass growing in places where you don’t want it, there are many chemical solutions for killing it. These products are readily available, but costly and dangerous for people and pets. The most effective safe method to use also happens to be the most inexpensive. Common table salt will kill unwanted grass. 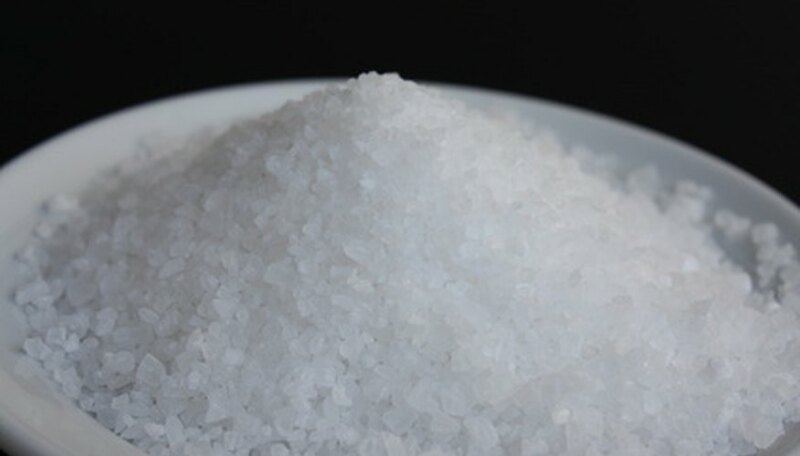 As benign as it may sound, using salt should be your last resort and you must take great care with this material. It doesn’t discriminate and doesn’t know the difference between bad grass and good grass. Salt destroys most plant life exposed to it. It will also kill beneficial organisms in the soil, including earthworms. Furthermore, salt continues killing until completely washed away. Make a spray guard cylinder. Use scissors to cut the bottom and top 2 or 3 inches off an empty repurposed plastic 2-liter bottle. Set this aside. Combine ½ gallon of hot tap water with 1 cup table salt. Mix until the salt has dissolved. Stir in 1 tablespoon of liquid hand dishwashing soap. Blend the solution well but gently to avoid creating excessive suds. Salt kills plants by causing them to dehydrate. Soap acts as a surfactant, making the solution adhere well to the target. Fill a plastic spray bottle with the salt solution. Set the plastic cylinder on the patch of grass, enveloping it with one open end. This will help to keep the salt solution where you want it and reduce the possibility of it drifting around, killing other plants. Stick the spray bottle nozzle into the top of the cylinder and direct the stream at the grass. Squirt it to coat all surfaces with salt solution. Draw the salt solution up into an empty needle-less syringe for easy spot applications in tight spots. Will Household Bleach Kill Grass?